Continuing to bring quality performing art from around the world to south central Kansas, the next concert in the 2017-18 Andover Organ Series will feature Italian organist, Davide Mariano at 7 p.m., Tuesday, Feb. 6, at Hesston Mennonite Church on the Hesston College campus. The concert is free and open to the public. Born in 1988, Mariano is the most active Italian organist of his generation on the international scene. He performs a repertoire ranging from the middle ages to the contemporary era. As an organist, harpsichordist and pianist, he collaborates with diverse orchestras and chamber groups across Europe and Japan. 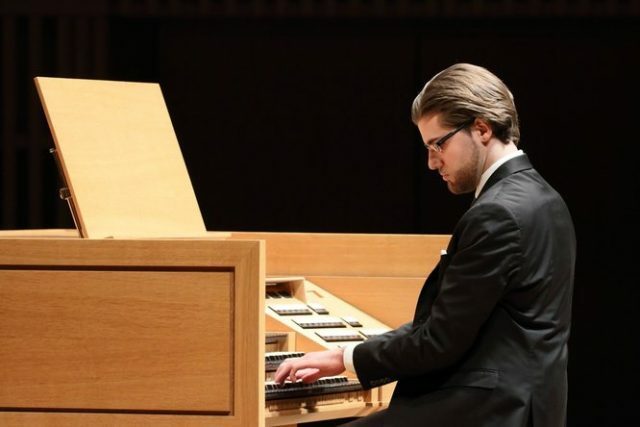 Mariano has been organist-in-residence for one year at the Sapporo Concert Hall “Kitara” (Japan) and is currently young-artist-in-residence at the St. Louis Cathedral in New Orleans. His upcoming performances will take feature him as a soloist at the Église de la Madeleine in Paris, the Musikverein in Vienna and the Tokyo cathedral. Mariano holds master’s degrees in organ and harpsichord from the University of Music and Performing Arts in Vienna, Austria, and an artist’s diploma in organ from the National Conservatory of Music and Dance in Paris. The Hesston concert is a continuation of the tenth anniversary celebration of the installation of the Andover organ at Hesston Mennonite Church. Andover organs are built by the Andover Organ Company of Methuen, Mass. The company builds and restores mechanical action pipe organs, and since its founding in 1948, has restored more than 500 organs across the United States, as well as building new instruments, including the Opus 116 pipe organ, installed at Hesston Mennonite Church on the Hesston College campus in 2007. Funded by the John Ernest Foundation, the Andover Organ Series at Hesston College features organists from across the world.